PennsylvAsia: Spirited Away (千と千尋の神隠し) playing in Pittsburgh, October 29 and 30. Spirited Away (千と千尋の神隠し) playing in Pittsburgh, October 29 and 30. Spirited Away centers on Chihiro, a sullen, fearful Japanese girl whose parents are moving so far out into the country that they predict they'll have to drive to the next town just to shop. 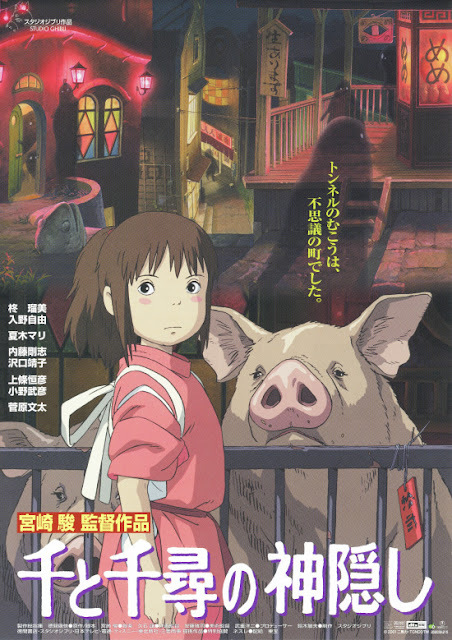 While traveling to their new home, they discover an abandoned, disintegrating theme park, which they cheerfully explore in spite of Chihiro's shrill protests. Suddenly, a boy approaches her and commands her to leave before nightfall. But before she can gather her wayward parents and escape, night does fall, in a breathtakingly eerie sequence that almost subsumes Chihiro's danger with its technical achievement. Chihiro is trapped in the spirit world, and in order to save herself, her parents, and eventually her new friend, she has to come to terms with herself and her unwitting captors. Gradually, in a series of almost episodic adventures, she learns to be brave and face up to her responsibilities to herself and the people she loves. The movie will play at Monaca, Monroeville, North Hills, and Pittsburgh Mills Cinemark theaters on two days: English dubbed on October 29 and Japanese with subtitles on October 30.